Following his short visit to Abusir and Saqqara necropolises, Zahi Hawass former minister of state for antiquities affairs launched an appeal asking field marshal Hussein Tantawi, head of the supreme council of army to stop all encroachment on Egypt’s archaeological sites, which reached 500 encroachments during the past two months. Abusir sits opposite to the famed city of Memphis on the river Nile just before the delta opens. Hawass told Ahram Online that what shocked him the most during his visit to both necropolises was the damage inflicted on the archaeological sites by neighbour inhabitants since Egypt’s January revolution. 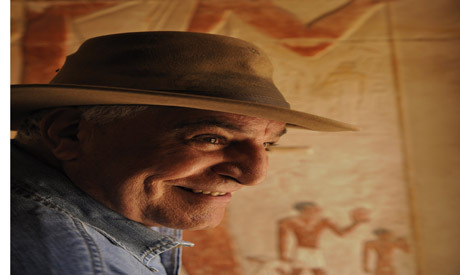 Hawass was motivated by devotion and responsibility towards Egypt’s heritage as an Egyptologist, even above his official role. He describes such encroachment as “a brutal crime” towards Egypt’s heritage, which belongs to the whole world. At Saqqara, villagers forcefully moved onto 15 acres next to the Pharaohs’ Tomb (Mastaba el Pharaoun) and the pyramids of Pepi I and II. “I am sure that this area contains archaeological remains dating to the Old Kingdom, over 4,000 years ago,” asserted Hawass. There, he went on, people constructed a large cemetery with about 500 huge tombs, about 4m high and 6x5m wide. In Abusir, people encroached onto an area that contains tombs from the 1st and 2nd Dynasties. They took over 10 acres and built modern tombs above these ancient tombs. A mosque has been also built on a neighbouring area that contains the 5th Dynasty causeway of Djedkare-Isesi, South of Saqqara. Hawass pointed out that all of these illegal structures were seen by the UNSECO delegation during their visit last week. They were really upset and asked for the immediate removal of these encroachments. Yesterday, top officials at the ministry of state for antiquities affairs sent a similar petition to Prime Minister Essam Sharaf to remove the encroachment and stop any further encroachment on the archaeological site. They also asked him for an immediate appointment of an antiquities leader in order to resume the ministry’s archaeological and administrative works. If you want to stop this sort of behaviour, start having public executions of the criminals involved, right there in the villages. It would quickly stop.